VaultPress scans your site every day, looking for dangerous code patterns in the files on your server. When something looks suspicious, a new threat appears on your VaultPress Security page and we email you automatically. We’ve recently updated the way we report site scan results, making it easier to act on existing threats. For the most common threats, a blue “fixer” button makes it easy to clean the affected files and secure your site. 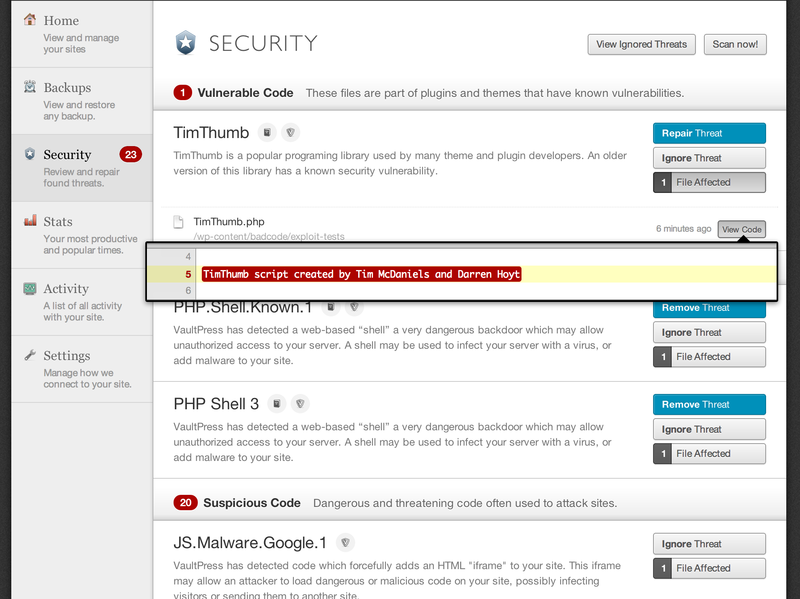 For threats without a “fixer” button, you can review the suspicious code. If you’re unsure about a threat, just ask a Safekeeper and get one-on-one support from our expert team of WordPress developers. VaultPress Security gives you the information you need to react to threats, and access to Safekeeper support for help. Learn more about how VaultPress can protect your content, themes, plugins, and site settings and customizations. Contact us with questions, or sign up to protect your site. This entry was posted in Design, Security and tagged design, Security, VaultPress, WordPress security. Bookmark the permalink. Correct, the security page is only available for VaultPress Premium subscribers.